The City of Springfield, Illinois, is a municipal corporation duly organized under the laws of the State of Illinois. It provides a variety of public services to its citizens, including but not limited to, the following: police protection, fire protection, street maintenance, snow removal, electric service, water service, recreation, community development, zoning, traffic safety, a municipal cemetery and library system. 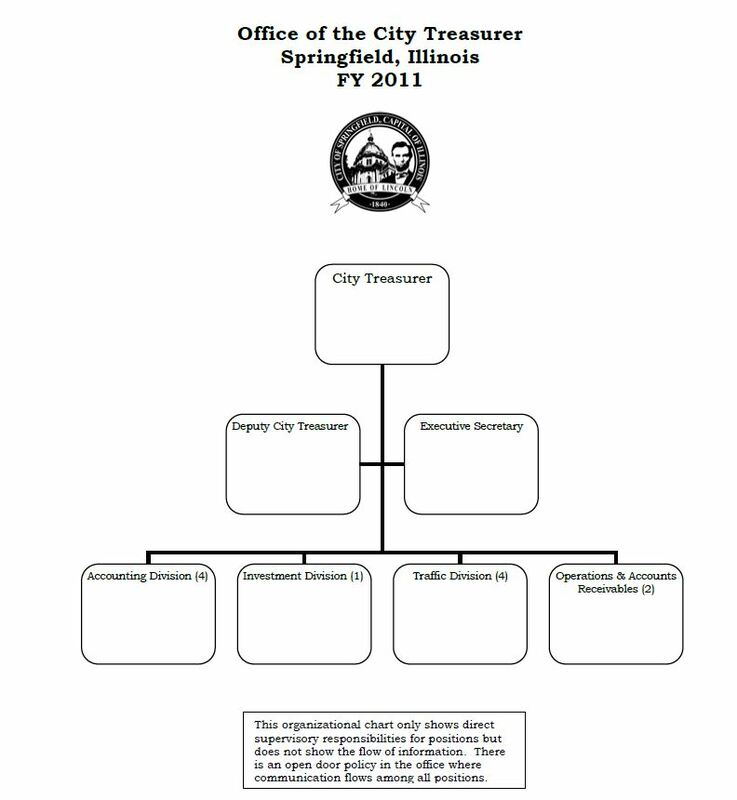 As of December 1, 1987, the City of Springfield, Illinois, has operated pursuant to the Mayor/Aldermanic form of government, consisting of a Mayor, City Clerk, City Treasurer and ten Aldermen. They City has a total operating budget of $564.9M for Fiscal Year 2014. The City, as of August 2013, has just under 1,500 employees, which includes 13 elected officials. § 33.002. Boards, commissions, etc. ; creation, appointment and removal. (a) The members of any city board, commission, bureau, agency or council shall, except as otherwise provided by this Code, be appointed subject to city council confirmation, by the mayor. Once appointed, the members shall, except as otherwise provided by this Code, be subject to removal by the mayor and shall serve at his pleasure. (b) The members of any board, commission, bureau, agency or council created by statute or by some other governmental body, wherein the city is given the right to appoint and/or remove members thereof, shall be appointed and/or removed in the manner prescribed therein unless the city, pursuant to its home rule power, is entitled to and does in fact alter the manner of appointment and/or removal. (c) Terms of office of all members of city boards, commissions, bureaus, agencies or councils shall be as specified in the ordinance creating them and until their successors are appointed and confirmed by the city council. (d) A vacancy on any city board, commission, bureau, agency or council shall be filled in the same manner as the original appointment for the remainder of the unexpired term, unless otherwise provided by this Code. (e) All city boards, commissions, bureaus, agencies or councils in existence on November 30, 1987, shall continue in existence unless and until changed by the city council. All members thereof shall continue to serve until their terms expire or they are removed in accordance with law or this Code. For the purposes of administrative supervision, the respective city boards, commissions, bureaus, agencies and councils shall be subordinate to the executive assistant to the mayor. (f) All city boards, commissions, bureaus, agencies or councils shall have authority to ratify, adopt and amend by-laws to provide internal governance, structure and rules to be applied during their respective meetings. Board members meet Monthly and are paid $150.00 for each meeting attended. Board members are not compensated. Members meet monthly. Chairman is paid $386.77 and Commissioners are paid $331.52 for each meeting attended. Members meet monthly. Chairman is paid $188.63 and Commissioners are paid $161.88 for each meeting attended. Members meet monthly. Chairman is paid $100.00 and Commissioners are paid $75.00 for reach meeting attended. Members meet monthly. Chairman is paid $267.71 and Commissioners are paid $237.96 for each meeting attended. Specifications for Clothing, Vehicles, Construction, etc. 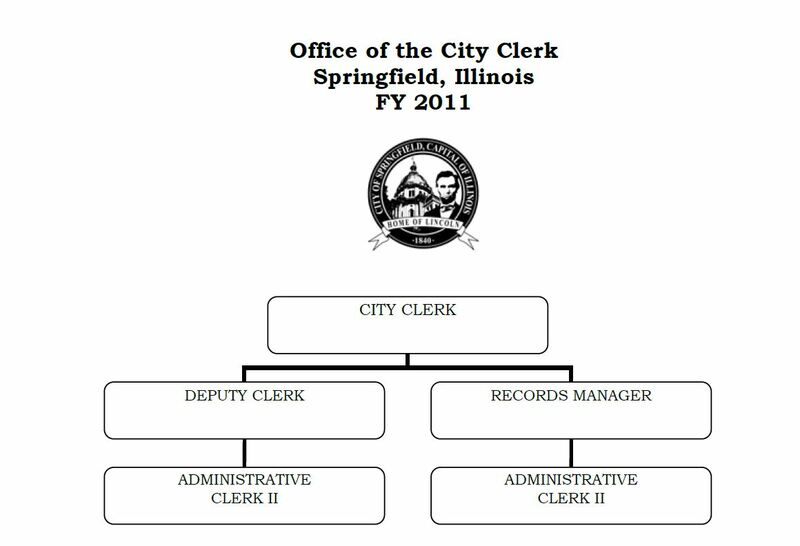 Any person requesting records of the City of Springfield, Illinois, which records are not customarily made available, may make such a request in person with the Springfield FOIA Officer, Office of the City Clerk, Room 106, Municipal Center West, 7th and Monroe Streets, Springfield, Illinois 62701, during normal business hours. Request for records forms will be made available at the Office of the City Clerk. A request for records may also be presented by mailing a written request to the address stated above. A request can be made electronically to the City Clerk’s office at cityclerk@cwlp.com or via facsimile to the Office of the City Clerk at 217-789-2144. To aid in processing, a request for records should specify in particular the records requested to be disclosed and copied. If the requester desires certification of any record, the request must specify the particular record or records to be so certified. For traditional black and white, letter or legal sized copies (8 ½ x 11 or 11 x 14), the first 50 pages are free, and any additional pages are $0.15 cents per page. For color copies or abnormal size copies, the charge is the actual cost of copying. Whenever possible, the response can be provided in electronic format via the requestors email. Section 1.1. Purpose and Scope. These regulations are promulgated pursuant to the Freedom of Information Act (FOIA), 5 ILCS 140/1. These regulations are intended to provide information concerning the procedures by which public records may be obtained from all departments of the City of Springfield. Public records of the City of Springfield made available pursuant to the requirements of the FOIA shall be furnished to members of the public as prescribed by these rules and regulations. Officers and employees of the City may continue to furnish to the public, informally and without compliance with the process prescribed herein, information and records which prior to the enactment of the FOIA were furnished customarily in the regular performance of their duties. These rules are not intended to be used to violate individual privacy, nor for the purpose of furthering a commercial enterprise, or to disrupt the duly-undertaken work of the City of Springfield. Section 2.1. Public Records Office. The Office of the City Clerk, Room 106, Municipal Center West, Springfield, Illinois, will process requests to inspect and copy public records. The normal business hours of the Office of City Clerk are 8:00 a.m. to 4:30 p.m. – Monday through Friday. Section 2.2. Requests for Records and Copies. (a) How made and addressed. A request for a record of the City which is not customarily made available or which is not available at the City Clerk’s Office may be made personally at the Office of the City Clerk on forms provided by the City Clerk or by mail, with the envelope and the letter clearly marked “Freedom of Information Request” or “Information Request.” All requests received by mail shall be addressed to the City Clerk, Room 106, Municipal Center West, Springfield, Illinois 62701. Requests can be made electronically via the City Clerk’s website at www.springfieldcityclerk.com. Requests can be made via facsimile to 217-789-2144. (b) Description of records sought. A request to inspect or copy a record should reasonably describe the record by reference to the subject matter, approximate date of issuance, if known, and the department, board, commission, or agency within the City which is responsible for maintaining the record, if known. (c) Information may be requested. Where the information supplied by the requester is not sufficient to permit location of the records with a reasonable amount of effort, the requester may be asked to supply additional necessary information which will enable the City department to locate the document. 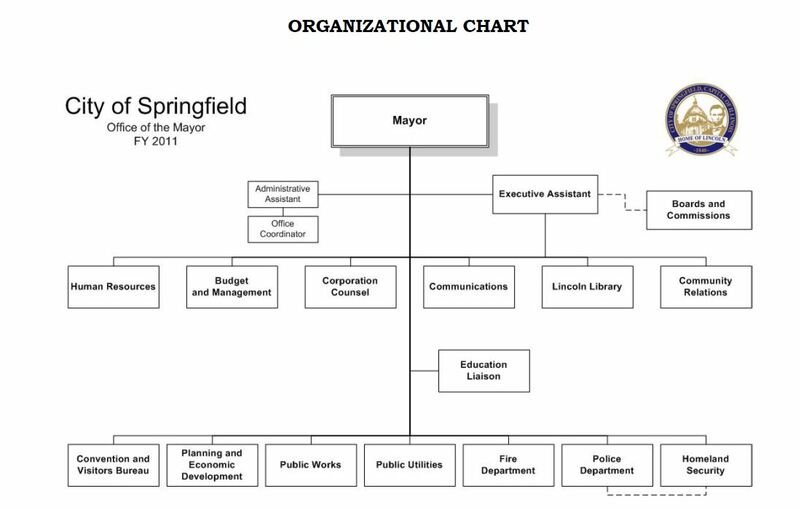 The Mayor shall appoint a FOIA coordinator for the Office of Public Works, Office of Human Resources, Office of Public Utilities, Office of Corporation Counsel, Office of Planning and Economic Development, the Office of Budget and Management, Springfield Fire Department and Springfield Police Department. The City Treasurer and City Clerk shall appoint a FOIA coordinator for their respective offices. The Mayor and City Treasurer shall notify the City Clerk in writing of the name of the FOIA coordinator for their respective offices. Section 3.2. Referral to Appropriate Office. The City Clerk shall make and retain a copy of each request for records. The Clerk shall forward a request-for-records via the electronic FOIA Tracking System to the FOIA coordinator for the office which has primary concern with the records requested. Within five (5) working days of receipt of a request, the Freedom of Information coordinator of the concerned office shall comply with or deny the request via the FOIA Tracking System. Section 3.3. Extension of Time. • The request requires the public body to consult with another public body who has substantial interest in the subject matter of the request. Section 3.4. Delay Treated as Denial. Failure to comply with a written request, extend the time for response, or to deny the request within five (5) working days from the receipt of the request is considered a denial of the request. Section 4.1. Form of Grant. When a requested record has been identified and is available, the City Clerk shall notify the requester as to where and when the record will be available for inspection or copies and of any applicable fees. Section 4.2. Form of Denial. (2) Notification of the requestors right to and instructions on the appeal process. (4) Advise the requestor that the request is unduly burdensome. Repeated requests for the same records may be deemed unduly burdensome under this provision. Section 4.5. Record Cannot Be Located. If a requested record cannot be located from the information supplied or is known to have been destroyed or otherwise disposed of or does not exist, the City Clerk shall so notify the requester. Whenever a request for records is denied in whole or in part, the requester may file a notice of appeal in writing. The Request for Review is filed with the Public Access Counselor at the Attorney General’s Office. The requestor may also seek judicial relief by filing a lawsuit in the State Circuit Court (5 ILCS 140/11). If you choose to file a Request for Review with the PAC, the request must be sent to the address below within 60 calendar days of the date of the denial letter. (5 IOLCS 140/9.5(a). The Request for Review must include a copy of the original FOIA request and the denial letter. (1) Decide that no further action is necessary. If the PAC decides that the alleged violation is unfounded and no further action is necessary, the PAC will inform the requestor and the City of that decision. (2) Request more information from the City. If more information is needed to review the issue, the PAC may, within 7 working days after receiving the Request for Review, send a copy of the Request to the City and ask for any records the PAC needs to complete the review. The City has 7 working days to provide the requested information. The Attorney General, through the PAC, has the authority to issue a subpoena if the City fails to fully respond. (3) The PAC may also try to resolve your FOIA dispute with the City through mediation or other informal efforts. If the PAC decides to issue a binding opinion, the PAC will issue that opinion within 60 calendar days after receiving all the information needed to decide the matter. The PAC may extend the 60-day time period by 21 working days by sending a written notice to the requestor and the City. This written notice must include the reasons for the extension. Section 6.1. Files of Denied Requests. Copies of all notices of denial shall be retained by the City Clerk in a single central office file that is open to the public and indexed according to the type of exemption asserted and, when feasible, according to the types of records requested. Fees are limited. For traditional black and white, letter or legal sized copies (8 ½ x 11 or 11 x 14), the first 50 pages are free. Additional pages shall be charged at $0.15 per page. For color copies or abnormal size copies, charges shall be the actual cost of copying. Section 7.3. Tape Recordings and Other Audio Records. Section 7.4. Form of Payment. Payment shall be made by cash, check, or money order payable to the City of Springfield. The Office of the City Clerk also accepts MasterCard, Discover and American Express. A convenience fee (2.10%) will apply. (6) The total amount of its operating budget. Section 8.2. Records Inspection Procedure. The City Clerk shall make available for inspection and copying a brief description of the City's record inspection procedure. The City Clerk shall make available for inspection and copying, a current index of City records. Section 8.54 Public Display of Information. The City shall prominently display at the Municipal Building, 7th and Monroe Streets, a copy of the municipal directory, records inspection procedures and City index of records.